With economic reform processes in place and an elected government since 2010, Myanmar is now considered Asia’s new frontier, or even its final frontier, as prospects for investment and international trade increase. Countries that had imposed sanctions in the past are now willing to invest and do business with Myanmar, which boasts abundant resources and an economy with enormous potential for growth. Many countries have already made inroads into Myanmar, with China leading the way. China’s influence is all pervasive, whether it be in trade, aid or infrastructure development. Yet China is now increasingly viewed as a hegemon and resentment towards Beijing appears to be mounting, with large sections of the Burmese population believing that China seeks to exploit Myanmar’s natural resources. Recent clashes in Kokang along the China-Myanmar border have complicated the bilateral relationship still further. Myanmar is now open for business, encouraging countries around the world to consider it as a strong destination for investment. Singapore, Japan and India, among others, are in the process of establishing an economic footprint in the Southeast Asian country. Two nations of particular importance to Myanmar are Japan and India, both Asian giants. Although Japan – operating under U.S. pressure – applied sanctions during the rule of the junta in Myanmar, cutting its aid, Tokyo did not cut ties entirely. Through private diplomacy and individual connections, Tokyo maintained its networks with businesses and officials in Yangon and since 2005 with Naypyidaw, the new capital. Japan resumed aid to Myanmar when the junta was replaced with a civilian government. In fact, Japan has been a long-time donor to Mayanmar, which was the first recipient of Japanese reparations in Southeast Asia in 1954. That aid connection remained strong. When the civilian government came in power in Naypyidaw, Tokyo waived close to $3 billion in debt and committed to new loans for a range of infrastructure projects. A substantial amount of Japanese aid has been devoted to assisting with the development of the local rail system, health facilities, and other civic amenities. Meanwhile, Japan’s direct investment has been steadily rising in recent years, and indeed Japan is catching up with China. In 2013 for instance, Japanese investment in Myanmar was $55.7 million, not far behind China’s $56.9 million. Three Japanese banks – the Bank of Tokyo-Mitsubishi UFJ (BTMU), Sumitomo Mitsui Banking Corp, and Mizuho Bank – recently won three of the nine licenses granted to foreign banks to operate in Myanmar. These three banks along with Japan’s aid agency, the Japan International Cooperation Agency (JICA) will be jointly developing the Thilawa Special Economic Zone just outside Yangon. JICA has a major presence in Myanmar with some thirty five employees and it appears Japanese aid to Myanmar will only rise, as Japanese corporations involved in development projects are likely to benefit. 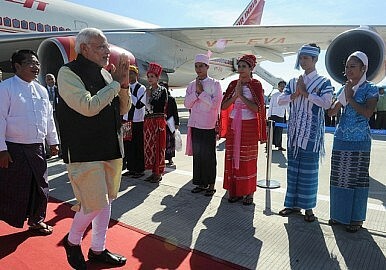 India has also been making steady inroads into Myanmar over the past decade. Bilateral trade, just over $1 billion in 2009, had risen to nearly $2 billion in 2013-2014. Estimates suggest that this figure may rise to $3 billion by 2015 and both sides are aiming to achieve an ambitious $10 billion by 2020. Like Japan, India has not confined its relations to trade. New Delhi is assisting Myanmar in areas such as information technology, agriculture, and infrastructure. Recently, India offered to assist Myanmar in bolstering its trade training institutes, and to train Myanmar trade officials on WTO-related issues. While both Japan and India have an economic interest in Myanmar, even more significant is its strategic location. India’s Look East Policy – recently redubbed “Act East” by the current government – will be a non-starter without greater connectivity and robust relations with Myanmar. It is in this context that former Indian Prime Minister Manmohan Singh travelled to Myanmar in 2012 – the first official visit by an Indian prime minister since 1987. Singh subsequently visited Myanmar in 2014, but that was in connection with the BIMSTEC Summit. Prime Minister Narendra Modi visited Myanmar in 2014 to attend the East Asian Summit, and a bilateral visit is also likely soon. Meanwhile, India-Japan relations have strengthened over the past decade, and the scope has widened to include security and defence cooperation. Prime Minister Narendra Modi’s visit to Japan in September 2014 and the warm reception he received from his host further illustrates the deepening of ties. . Both countries have strategic interests in Myanmar. Of course, any military cooperation has the potential to ratchet up tensions with China. But there is potential for India and Japan to explore other synergies in Myanmar. The Japan International Cooperation Agency (JICA) is investing $100 million in developing infrastructure in Northeast India, which will not just help in the development of that region but will also enhance connectivity with Myanmar. Looking beyond economics, assisting Myanmar, for example with institution-building and developing cultural assets – areas that might be considered to come under soft power – could serve the interests of both Japan and India in the long run and provide a useful platform for launching other form of cooperation, including economic. Both India and Japan could also help develop Myanmar’s information technical sector by establishing training institutions. Other possible areas could be the development of a Buddhist tourist circuit extending from Eastern India to Myanmar. Buddhism is an important link between the three countries, and Japan has already provided generous assistance for reviving the Nalanda University in Bihar. The two countries can also cooperate to develop world class research centers in Myanmar focussing on Buddhism. While a Japan-India partnership in a third country has yet to take shape, Myanmar could be a good place to start. In fact, it makes perfect sense given the increasing strategic congruence between India and Japan, and the fact that the nature of the assistance they provide is very similar, even if the scale is not. Purnendra Jain is Professor in Asian Studies at the University of Adelaide. Tridivesh Singh Maini is a Senior Research Associate with The Jindal School of International Affairs, Sonepat.